What follows is largely based on the 1861 census returns for the parish. The census recorded basic details of all who were resident here on the night of April 7th. I have also referred to the church parish register data for 1859-61, thanks to transcripts made by Judy Hodges and stored in the Winsham Web Museum. Another data set from the WWM was of chapel baptisms recorded around the same time and transcribed by Liz James. 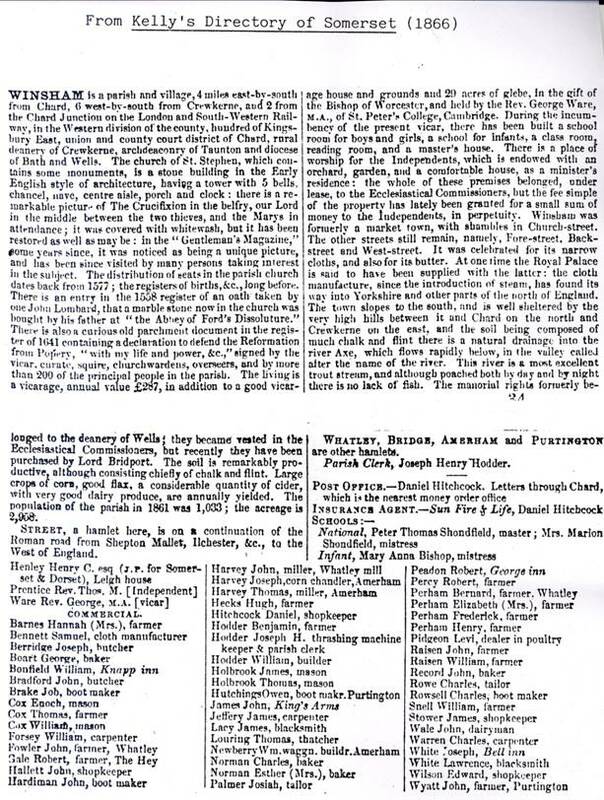 Finally I have reproduced the Winsham page from Kelly’s Directory, 1866. This is not a piece of serious historical scholarship. The analysis I have done is mainly number crunching and there are no colourful anecdotes illustrating how people lived or what they thought. The statistics do not “prove” anything; they merely represent a snapshot in time. To set the scene, it may be helpful to note a few of the historic events that happened around 1861. · Five days after the Census, the first shots of the American Civil War were fired. · The Crimean War had ended about 5 years earlier. · Albert, Price Consort, died in December 1861, aged 42. · Lake Victoria had been “discovered” less than 3 years earlier by John Speke, from a local family. · “Great Expectations”, by Charles Dickens, was being published in serial instalments. · The Prime Minister was Lord Palmerston. Two of these just outside the parish and are not counted in any of the later statistics. Cricket House. Lord Bridport (72) gave his rank, profession, or occupation as “Peer”. Lady Charlotte was Duchess of Bronte in her own right, a Neapolitan title derived from her uncle, Horatio Nelson. There were 11 resident staff: a butler, under butler, footman, coachman, groom, lady’s maid, two cooks and three housemaids. Leigh House. Henry Henley (26) lived with his widowed mother (46) and a young brother and sister. He described himself as a magistrate and captain of militia. Two female visitors were there on census night as well as nine resident staff: butler, footman, groom (aged 12), gardener, housekeeper, ladies maid, cook, kitchen maid and two housemaids. Forde Abbey. George Miles (41), a magistrate and banker, born near Bristol, lived at the house with his wife and unmarried sister. The staff of ten comprised butler, two footmen, coachman, groom, ladies maid, cook, kitchen maid and two housemaids. These were all in Winsham, but outside the village. Mr Harvey (64), the Ammerham miller, was head of a household of 11. Two adult sons helped in the mill, and the family there included his wife, two unmarried daughters and a grandson. He also employed a dairyman, carter and two apprentices who all resided on the site. Incidentally, the other miller in the parish (at Whatley) was also a Harvey, aged 36. Farmer Wyatt (42), in Purtington, and his wife had 11 children aged between 7 months and 18 years; the oldest four helped on the farm. In addition there was a governess and dairymaid. Mr Budge (54) was an agricultural labourer, also in Purtington. His wife (44) worked as a glove maker. They had 9 children at home and five of the boys were also described as agricultural labourers. The average 1861 Winsham household contained 4.8 persons, although with a fair number of boarders and lodgers (the latter often counted as a separate household) it is difficult to give a precise figure. In the 2011 census the average household size was 2.2 persons. There is some uncertainty over the numbers of agricultural labourers (by far the largest group) and farmers. The census taker sometimes designates the head of the household as an agricultural labourer and then continues with ditto marks for wife and children (once down to a 5 year old). Similarly “farmer’s wife” and “farmer’s son” are given as occupations, which is probably true, but if the wife has young children, farming is unlikely to be a full-time job. Therefore the numbers I have quoted below are the minimum estimates for these occupations. In addition, 14 heads of household, all in the village, were retired or gave no occupation. Several of these had boarders or lodgers, probably to provide an income. Others were supported by working family members. The parish population aged between 10 and 69 was 724, of which 73% were economically active. Around 62% of the 1033 parish population lived in the village. Other occupations included three clergy, plus a visiting Mormon, eight school teachers or trainees, carters, innkeepers and barmaids, tailors, shop assistants, thatchers, wheelwrights, gamekeepers, farm bailiffs, two midwives, a police constable and a single road labourer. The latter was a 58 year old widow. The extract from Kelly’s Directory for 1866 (at the end) lists many of these businesses, including the four inns. The number of railway labourers may be surprising. The railway between Crewkerne and Axminster was opened in 1860, but the Chard Junction to Chard Town link was still being constructed and track maintenance would have been ongoing. The proprietor of the cloth factory (or wool manufacturer) stated that 12 men, 15 girls and 3 boys were employed in the business, which very closely matches the number in the table. As the factory played a major role in the mid 19th century village economy, a small digression may be in order. Elsewhere in the WWM there is an account of Samuel and Mary Bennett, a couple originally from Thorncombe, who ran the business. In the 1851 and 1871 censuses they were residing in Church Street with some of their children. However in 1861 only Mary Bennett was there, with two sons, while Samuel was in Back Street with a daughter and gave his occupation as master baker. Kelly’s Directory for that year described him as “Baker and worsted spinner”. = Railway, road, lime burner, sawyer, etc. There were 535 males and 496 females. Unfortunately I missed two. Beyond age 30 there were more women than men. The numbers in the 30-39 age group look surprisingly small, but I have not investigated reasons. It may be of interest to observe that anyone aged 56 or over was born before the Battle of Trafalgar. We have some comparison figures based on the Office for National Statistics census of 2011, kindly provided by Mike Smith of the Somerset Intelligence Unit at the County Council. The chart shows the percentage of the population falling into various age groups. Age categories are adjusted to coincide with 2011 data. The total population in 2011 was 748, and the proportion of females has risen from 48% in 1861 to 52%. I had expected early marriages in the mid 19th C and more widowers than widows because of the mortality risks in childbirth. The table shows the percentages of men and women in two age ranges who were either unmarried or widowed on census day. For example, 12% of women in their thirties were widows. Of course, this does not tell us at what age a woman was widowed or what proportion subsequently remarried. Possibly widowers were more desperate to remarry, or for social and economic reasons found it easier to do so. These figures are derived from households headed by a man residing with his wife. Ages were recorded in the census as 25, 47, etc, so a husband and wife both shown as 33, say, are regarded as the same age, although the actual difference could be 11 months. The table below shows age differences between husband and wife and the number of married couples in each group. I wanted to get an idea of how many people were born in Winsham and still lived there, relative to those who had migrated in from further afield. Arguably if a husband and wife are living with their family in the parish, the children would be expected to be Winsham born. It could be more informative to look at adults, and for simplicity the heads of the 212 households. I put place of birth into one of three categories: Winsham parish; within about 5 miles of Winsham village (for example Chard, Crewkerne, Hawkchurch); and further away. The latter category is very broad. It would include Combe St Nicholas, Axminster, Beaminster, Cornwall, London and Manchester. On this crude basis, 39% were born in Winsham, 33% close by, and 28% further away. When other adults are counted, such as wives, the Winsham percentage is slightly reduced. The great majority of baptisms were those recorded in the parish church register. In some cases the chapel birth year has been used instead of the baptism year. Burial statistics are all taken from the church register, 44 in total. One of the 1859 male burials had no recorded age. In addition there was one burial in 1860 of an 80 year old whose name (and therefore gender) is unknown. The table below shows the numbers in each age decade. Both tables have a total of 43 entries. All the children in the first group were aged 4 or under. This was opened in 1837 to provide a refuge for the needy from 34 surrounding parishes. It had a capacity of 300 inmates. In the18th century Winsham had its own workhouse with a capacity of 40, so I wondered whether a fair number of people from Winsham, perhaps elderly paupers, might be found in Chard workhouse. The 1861 census reveals that the workhouse had six resident staff, including two school teachers, and 108 inmates, 60 of whom were female. Four inmates were born in Winsham: a boy and a girl aged 1 and 11, a chimney sweep aged 36, and a female agricultural labourer aged 49. This does not suggest that relocation to the workhouse had a significant impact on the census figures for Winsham. What were the most popular names being given to Winsham children born around 1861? For boys the top name was John, closely followed by William, then George, Henry and James. For girls, Elizabeth was the favourite, with Mary a little way behind and then a wide scatter. Even looking at women aged 70 and over in 1861, Elizabeth and Mary were again the top two names. Note that all the most popular were the names of English monarchs. I suspect the 21st century is different. Attached is the Winsham page from Kelly’s directory. Note the reference to fishing in the Axe.